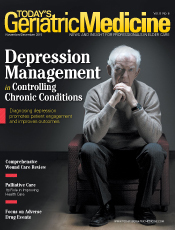 Depression concomitant with chronic illness requires diagnosis and treatment for physicians to effectively manage older adults' chronic conditions. Because wound etiologies are multifactorial, clinicians must recognize the need for a comprehensive and individualized plan of care to ensure patients' successful wound healing. 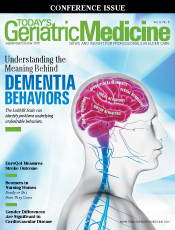 Without identifying the meaning of dementia patients' behaviors, health care teams struggle to create appropriate nonpharmacological interventions that properly address patients' needs. The LuBAIR Scale can help to identify problems underlying undesirable behaviors. Providers' recognition of gender-specific aspects of cardiovascular disease and implementation of efforts to provide information to boost women's awareness of its symptoms and dangers are key to improving women's heart disease mortality rates. The EuroQol assessment provides meaningful information about stroke survivors' perceptions of resulting stroke-related physical deficits and their own quality of life. Physical and psychosocial changes in older adults can lead to significant reductions in oral intake. 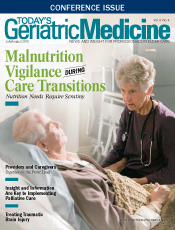 Physicians must identify diagnostic criteria that signal elders' increased risk of malnutrition, particularly during transitions of care. One of the fastest growing fields in medicine, palliative care focuses on a patient's quality of life, providing treatment through all the challenges of his or her clinical course. Speech-language pathologists help patients to develop compensatory strategies for attention/memory/reasoning impairments following brain injury, which often occurs as a result of falls. Speech-language therapists also train caregivers to assist patients with implementing these strategies. Caring for a family member requires a partnership between physicians and patients' caregivers to meet the specialized challenges to family caregivers. Physicians must familiarize themselves with basic information to provide to caregivers seeking resources and solutions. 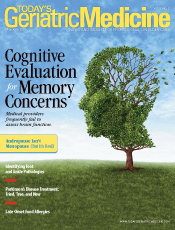 Many older adults fail to receive a clinical cognitive evaluation from a medical provider despite the reduced costs and the extension of a patient's time in the community an early dementia diagnosis offers. Physicians must recognize which patients are good candidates for testosterone replacement therapy as well as the associated risks and benefits of the treatment. Amid Parkinson's disease patients' physical limitations, financial costs, and emotional fallout, treatments hold some promise for symptom management and slowing disease progression. 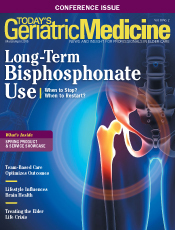 Duration of bisphosphonate treatment and possible discontinuation should be personalized for patients based on their response to treatment, fracture risk, and comorbidities. Coordinated communication among care team members ensures that patient care decisions consider input from clinical specialists, expedited service delivery, and cost-effective strategies. As baby boomers age, more emphasis than ever is being placed on brain health to combat Alzheimer's disease and other forms of dementia. The article examines brain games' effectiveness and outlines a memory program used to improve brain fitness. Elder life crisis, which often manifests in older patients in their later years, is characterized by feelings of loneliness, helplessness, and boredom. Physicians must learn to identify and address the condition. 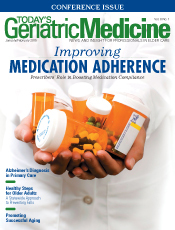 Physicians must be proactive in combating medication nonadherence, which results in an estimated total of increased direct and indirect costs of $290 billion per year in avoidable medical spending and lost work productivity. The National Institute on Aging—Alzheimer's Association guidelines provide clarity to primary care physicians regarding the diagnosis and treatment approach for patients with Alzheimer's disease and highlight the need for regular follow-up and management. The evidence-based, low-cost, community-based fall risk screening and education program for adults aged 60 and older has been offered through the Pennsylvania Area Agencies on Aging network of senior centers.